KOPLAYER Forum » KOPLAYER -- Android Emulator on PC (Windows/Mac) » Q&A » KOPLAYER Tutorials » How to Modify DNS in Windows XP System? How to Modify DNS in Windows XP System? 1. Right click "My Network Places" in the desktop, and choose "Properties". 2. Right click "Local Area Connection Properties" and choose Properties. 3. Find "(TPC/IP)" in the window and double left click it. 4. 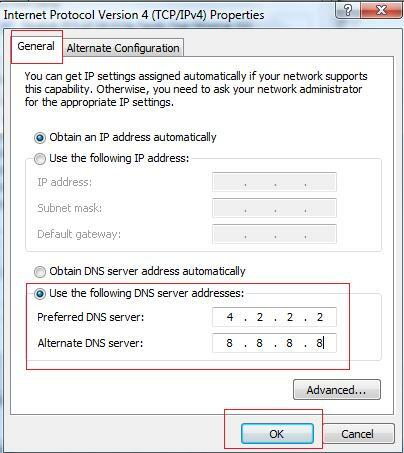 Modify your DNS as below picture shows. If the window appears in your PC is different with this picture, PLS MUST SEE LAST PARAGRAGH AND PICTURE. OR THEREN MAY HAVE SOME MISTAKES. 5. After modifying the DNS, return to Run in Start Menu which will brings up a window. Type cmd in it and click sure. 6. Type order “ipconfig/flushdns” in the window and press Enter key to refresh DNS cache. You can repeat this step for 2 or more times. Now we finish all steps to modify DNS. You can restart the game to have a try. If the update problems still exist, you can restart your network equipment (like Router). NOTE: If your computer has shown IP address when you modify the DNS, we suggest you can do a screenshot and save it in a file. If you are off the Internet because of modifying DNS, you can type your IP address as the screenshot to restore.